This recipe for grilled chicken tenders in unbelievable, delicious, and easy to make on your Foreman Grill. With a few basic ingredients, the flavor of will be, quite simply – “unbelievable”. The vinegar, mustard, lime juice brown sugar give a sweet tangy taste that will knock your socks off. Give this recipe a try – it’s… unbelievable! Cut 1 lb of boneless skinless chicken breast on tenders. Size should be about 1″ wide by 3-4″ long. 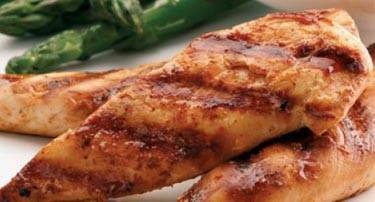 If chicken breasts are very thick, pound them down to 1/2″ – 3/4″ thickness for better contact grilling results. Combine olive oil, vinegar, brown sugar, course mustard, salt, pepper and lime juice in a container or ziploc bag and mix well. Add chicken and let marinate for at least 30 minutes. Preheat your George Foreman Grill for at least 5 minutes with the lid closed. Add chicken tenders and close lid. Grilling times are approximate, but check tenders after 3-5 minutes. Chicken will be done when no longer pink in middle and an internal temperature of 165F. My George Foreman grill has temperature settings and the recipes do not say what temperature to set the grill for. Mine has degrees so that information would be helpful plus maybe some time information as too approximate how long it would take to reach desired being done. I really need nutrition counts. Must have sodium, calories, fat and sugar especially! Doctor’s strict orders!